As an adult, I have always loved children’s books. Before I had kids, I used to position myself close to other people’s children in bookstores as I indulged my picture book habit. The idea was to give the appearance that I was somehow connected to someone else’s unsuspecting child and therefore “vetted” as a children’s book browser. I guess, deep down, I had internalized that official New York City playground rule that prohibits adults except in the company of children. Finally, a few years later, with my own children in tow, I could freely enter the children’s section at my local bookstore without any fear of my true motives being discovered. Recently, upon learning of a reprint of Japanese photographer Eikoh Hosoe and Betty Jean Lifton’s 1967 children’s book Taka-chan and I, I quietly let slip my interest in children’s books to the staff at the International Center of Photography Library. Not surprisingly, I had company. Turns out, they also indulged in children’s books, especially those with a photography focus. On a shelf, just before the glass enclosed rare book section, sits a nice selection of children’s books by well-known photographers that include Albert Lamorisse’s classic The Red Balloon (1956), Ylla’s animal themed books (1940s-50s), Jill Krementz’s A Very Young Dancer (1976) and photojournalist David Douglas Duncan’s Yo-Yo Kidnapped in Provence (2011). What follows is a highly personal selection of children’s books in the ICP Library collection by Eikoh Hosoe and writer Betty Jean Lifton; Dare Wright; and Alec, Carmen and Gus Soth. When one mentions the work of Japanese photographer Eikoh Hosoe, few think of children’s books. Rather, as a founding member of the influential Vivo photography agency in 1959, Hosoe is best known for his surreal and haunting images of Yukio Mishima, and jarring formal compositions of black and white nudes in Man and Woman / Otoko to Onna (1961). So, it comes as a surprise to many that he collaborated on 4 children’s books with American author Betty Jean Lifton from 1967-1985. In the first 2, Hosoe uses carefully staged and moody images to illustrate Lifton’s culturally rich stories that explore the Japanese countryside and Tokyo through the eyes of dogs. 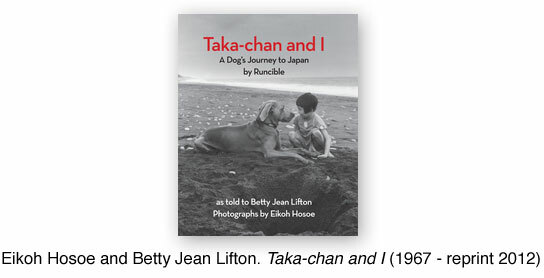 The first book, Taka-chan and I (1967 – reprinted 2012) tells the tale of Runcible, a Weimaraner, who digs a hole from Cape Cod to a deserted beach in Japan, where he is discovered by a little girl named Taka-chan. She is being held by an evil dragon, who has taken her captive because her father and his fellow fisherman no longer pay him respect. Runcible courageously asks the Dragon to release Taka-chan and the dragon says he will grant the request on one condition, that they find the most loyal being in Japan and place a white flower at his feet. Thus unfolds, through Lifton’s prose and Hosoe’s photos, an adventure that introduces western children to Japanese customs, folktales, and the legend of Hachiko, Japan’s most faithful dog. Hosoe’s photographic range is beautifully illustrated through interior scenes that are draped with ominous shadows, wide-open country lanes and crowded urban streets framed by doorways covered with traditional Japanese half-curtains (noren). 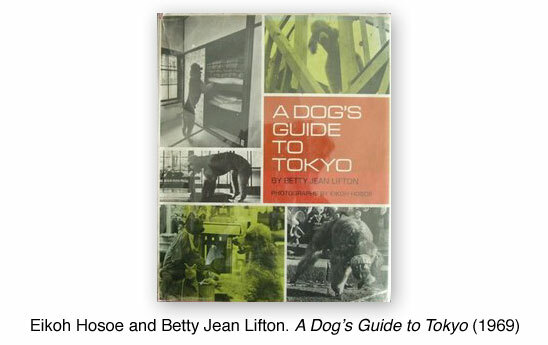 In addition to Taka-chan and I, Hosoe and Lifton also collaborated on A Dog’s Guide to Tokyo (1969), which stars Jumblie, Lifton’s standard poodle, whose task is to “give western dogs a sniff of Japan” (Lifton). Jumblie takes the reader on a tour of Tokyo, explaining how low dining tables are convenient for table scraps, and the Japanese custom of leaving a bit of rice in the bowl at the end of a meal is another welcome custom from a dog’s perspective. Sadly, A Dog’s Guide to Tokyo is currently out of print and there are no plans for a reprint. 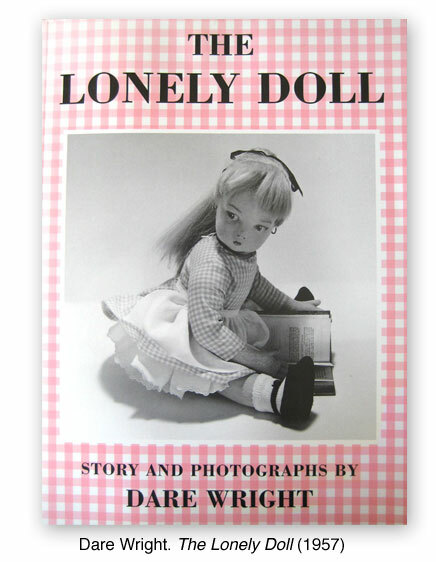 Also about adventure, friendship, and loss, but from a psychologically dark perspective, are children’s book author and photographer Dare Wright’s The Lonely Doll series, which immediately found a strong following with little girls upon its publication in 1957. The somewhat politically incorrect story of the first book presents a lonely little girl named Edith, who wishes for playmates to join her in her majestic New York City home. One day, she is happily surprised by the arrival of Mr. Bear and Little Bear. What follows are the mischievous adventures of Edith and Little Bear while Mr. Bear is away for the day. Finding a secret woman’s dressing room in her home, Edith and Little Bear play dress up and scrawl messages in lipstick on a mirror about Mr. Bear being “just a silly old thing.” When Mr. Bear returns and finds them covered in jewelry, oversized women’s clothing and lipstick, he punishes them with spankings (the politically incorrect scene). 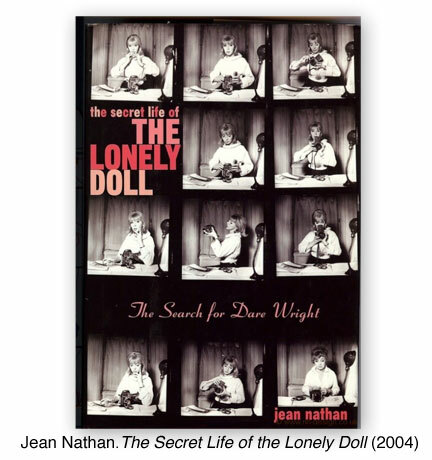 As a child, I was unaware of The Lonely Doll series and only discovered them as an adult through journalist Jean Nathan’s biography of Wright, The Secret Life of the Lonely Doll (2004). The books, which in recent years have taken on a cult-like status among many women in their 40s and 50s who remember them as childhood favorites, are described by Nathan as thinly veiled tales about Wright’s own dysfunctional family history. Raised by a selfishly manipulative and overbearing mother who cut off all contact with her father and brother, Wright is portrayed by Nathan as a classic “Peter Pan,” a psychologically childish adult who doesn’t want to grow up. In contrast to Dare Wright’s now politically incorrect, yet much loved stories of Edith and her bear friends, are the playful, endearing and refreshingly naive Brighton Picture Hunt book and The Brighton Bunny Boy zines by American photographer Alec Soth’s daughter Camen and family (mom Rachel is credited as bunny wrangler, dad as editor/photographer, and bother Gus as the bunny). 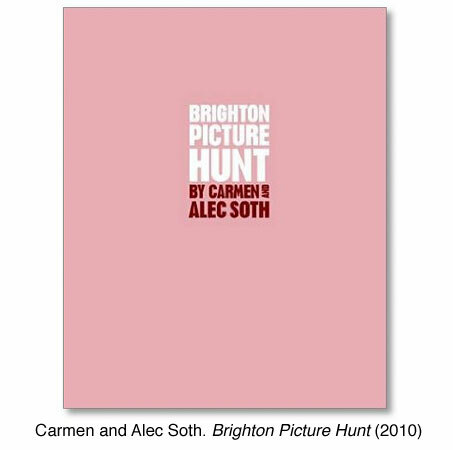 As a creative solution enacted when Soth arrived in the UK to work on a commission for the Brighton Photo Biennial 2010, but was denied a work visa, Brighton Picture Hunt (2010) is the outcome of his daughter Carmen’s photographic exploration of the south England town of Brighton. With father in tow, Carmen, then 7 years old, used Soth’s digital camera to shoot photographs each day from her 4 foot tall perspective. Highly vernacular in feel and devoid of any photographic conceit, the color images cover a wide range of subjects: street scenes, trash, nature, pedestrians, and animals (dogs being one of her favorite subjects). Besides chaperoning the young photographer, Soth’s job was to edit a cohesive selection from the over 2000 photographs shot during the father-daughter outings. Besides forming the basis for the book, the final edit stood center stage as Alec Soth’s replacement in the Martin Parr curated Brighton Photo Biennial. Quite a coup for a 7 year-old photographer! Flush with the success of Brighton Picture Hunt, Carmen and brother Gus have embarked on a series of zines about a fictional character known as “Bunny Boy.” To date, there are 2 releases: The Brighton Bunny Boy (2010) and Bunny Boy Goes to Rome (2011). Similar to Wright and Hosoe/Lifton’s books, the zines address childhood fears of loneliness, loss, and isolation. 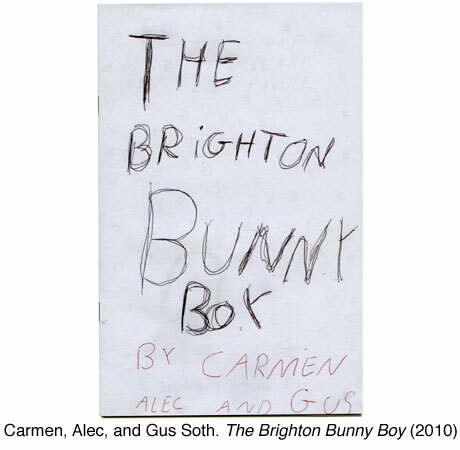 The first zine, The Brighton Bunny Boy, tells the tale of a little girl who visits Brighton with her family and reads a local news article about a bunny who has the face of a boy. The bunny is very shy and won’t show his face because “people [get] freaked out” by it. The little girl meets him and becomes his friend and convinces him to come home with her for Easter and show his face. 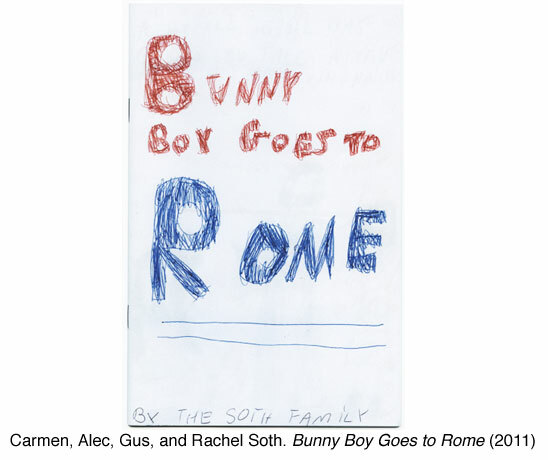 Told through Carmen’s hand lettered words and colorful drawings, which are interspersed with Alec’s photos of Gus dressed as the bunny boy, the zine has a pleasing sincerity and innocence in the best tradition of children’s books. The adventures of Bunny Boy are continued in Bunny Boy goes to Rome (2011), where a Little Girl upon arrival at the hotel is surprised to find her good friend Bunny Boy hiding in her suitcase. Just like Hosoe / Lifton’s Taka-chan and Runcible’s Tokyo quest, Bunny Boy and the Little Girl explore Rome together. They eat gelato, take pictures and visit the Pantheon, where Bunny Boy gets lost. Fortunately, he meets a magic peacock that opens its feathers and casts a spell that reunites him with the Little Girl. All ends well and as Carmen writes on the last page, “Stay tuned for the next Bunny Boy.” I’m hooked. Sign me up for the email alerts. Chances are, I will also be able to read the next Bunny Boy zine installment at the ICP Library, where I won’t have to come accompanied by a child to look at it. This is good news, because I definitely don’t want my children’s book habit to result in a similar outcome to the two women who were ticketed last June by New York City Police when they decided to enjoy doughnuts in a Brooklyn playground unaccompanied by a child. Hosoe, Eikoh and Betty Jean Lifton. Taka-chan and I (2012- reprint). Recent acquisition. Call number not yet available. Hosoe, Eikoh and Betty Jean Lifton. A Dog’s Guide to Tokyo. New York: W.W. Norton, 1969. Out of print and not in the ICP Library collection. Nathan, Jean. The Secret Life of the Lonely Doll: The Search for Dare Wright (2004). Wright, Dare. The Lonely Doll (1957 – reprint c.1985). Wright, Dare. Holiday for Edith and the Bears (1958). Wright, Dare. Edith and Mr. Bear (1964). Wright, Dare. A Gift from the Lonely Doll (1966 – reprint 2001). Wright, Dare. Edith and Big Bad Bill (1968). Wright, Dare. Edith and Little Bear Lend a Hand (1972). Soth, Carmen and Alec. Brighton Picture Hunt (2010). Soth, Carmen, Alec and Gus. The Brighton Bunny Boy (2010). Soth, Carmen, Alec, Gus and Rachel. Bunny Boy Goes to Rome (2011). This entry was posted in artists' books, International, New Acquisitions, Unpacking the collection, Visual Research and tagged A Dog's Guide to Tokyo, Alec Soth, Betty Jean Lifton, Bright Picture Hunt, Bunny Boy Goes to Rome, Carmen Soth, Dare Wright, Eikoh Hosoe, Gus Soth, Jean Nathan, Russet Lederman, Taka-chan and I, The Brighton Bunny Boy, The Lonely Doll, The Secret Life of the Lonely Doll. Bookmark the permalink.